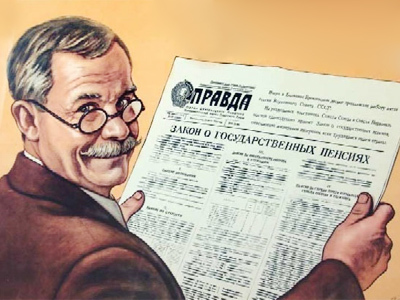 The last edition of Murdoch’s News of the World tabloid has hit the streets, as he arrived in London to hammer down the growing scandal, rebuild his company's reputation, and save the media-king-size takeover deal. 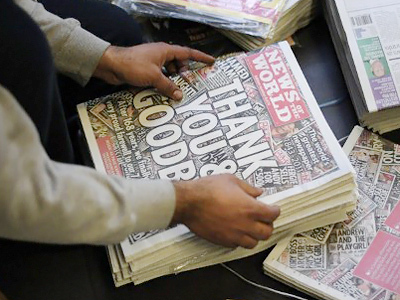 ­After 168 years and 8,673 editions, Britain’s most popular weekly tabloid said a sad but proud farewell to its loyal readers. The News of the World final has been entitled simply – “Thank You & Goodbye”. "This is not where we wanted to be and it's not where we deserve to be, but as a final tribute to 7.5 million readers, this is for you and for the staff, thank you," Reuters quoted Colin Myler, the editor of the News of the World. Meanwhile, Rupert Murdoch has arrived at the east London office of his News Corporation. Murdoch has been seen with a copy of the last edition of the News of the World in his hands, the Associated Press reported. According to the Guardian, Murdoch will hold meetings with his son and the former News of the World editor Rebekah Brooks to come up with a strategy to save the media empire. As a first step in rebuilding his company's reputation a new Sunday edition of the Sun will be launched to fill the void left by the News of the World. 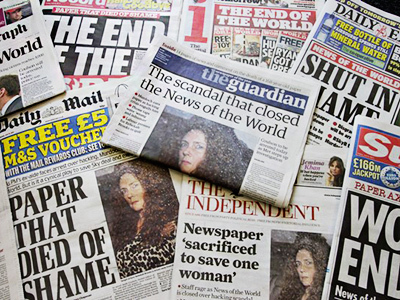 Rebekah Brooks is expected to be questioned under police caution this week. Earlier she warned that even more details of the phone hacking scandal could be exposed, the Associated Press reported. 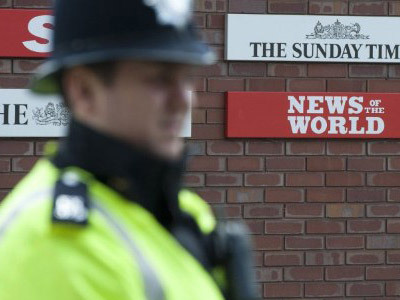 Meanwhile, as Scotland Yard seized computers and other evidence in the News of the World newsroom, nine more journalists and three police officers may be facing jail in connection with the phone hacking scandal, the Herald Sun reported. The News Corp chairman and chief executive Rupert Murdoch stated he is not planning any management changes in News Corp as a result of the scandal. "We've been let down by people that we trusted, with the result the paper let down its readers," Rupert Murdoch commented on the "collective decision" to close the newspaper. News Corp, the operator of the News of the World, had been considering closing the title for nearly a year, The Telegraph reported. Senior figures looked at it as an option to try to halt the flood of bad publicity over hacking claims, the paper said. Meanwhile, News Corp shares fell about seven per cent since July 5 with more falls expected on Monday. 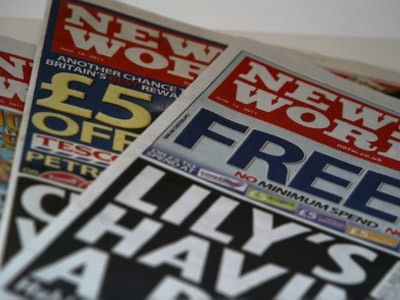 News Corp also owns two daily newspapers and another weekly paper in the UK, and aims to purchase 60 per cent of the British Sky Broadcasting pay-TV operator. Rupert Murdoch came to London on Sunday to try to save the $14 billion takeover deal which is about to be blocked by the Labour Party. Ed Miliband, the leader of the Labour Party, is seeking cross-party support for a motion in parliament that would postpone that deal until the criminal investigation into the hacking scandal is complete, the Telegraph reported. Despite Prime Minister Cameron’s tacit support of the deal, the government has received over 135,000 complaints against it, Reuters reported. 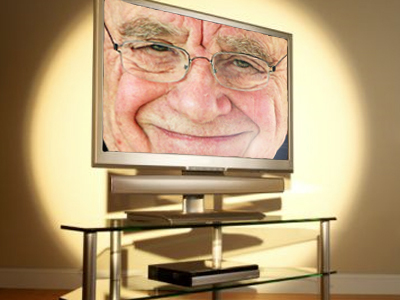 Murdoch’s agenda in Britain remains unknown, as the News Corp representatives refused to give any comments. Murdoch is also expected to use his visit to support the News Corp executives who are to be questioned by the police, and his son James, and their efforts to hammer down the growing scandal and rebuild his company's reputation. Spokespersons for Britain’s Department for Culture, Media and Sport and the prime minister’s office stated they have no scheduled meetings with Murdoch.